PawSox Heavy: Ramp CHAMP! 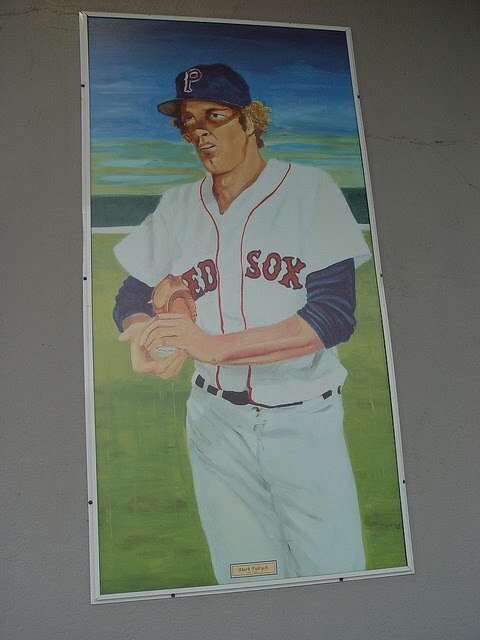 Mark Fidrych is number 26. 1983 would be the last year of pro ball for Fidrych. He played in 12 games, started eight of them. His ERA was 9.68. 1. Jesus Christ. Try reading this story about Fidrych's time in Pawtucket without welling up. Well done, Jim Donaldson. 2. DAMN! Check out a fan's remarkable account of their time at McCoy feat. M. Fidrych and the historic pitching match-up. Great stuff. I have to stop, this is too hard. I imagine this will easily be the saddest mural profile I will do. Endless thanks to Lil' Rhody Dan for letting me use his superlative McCoy snaps. Pay your respects in the middle of the first base tower.